This anthology of poetry, prose and pictures celebrates the essential nature of the railways in forming Victorian England. This quotation from Ruskin announces the arrival of the latest anthology from Stairwell Books and The Spoken Word. This anthology of poetry, prose and pictures celebrates the essential nature of the railways in forming Victorian England; the England that followed; and the England that has made us the way we are now. The poems and short stories range from paeans of praise to the intimacy of the moment: the recognition of the station platform as a boundary between going and staying; love and nothing; and a place for just waiting. Enjoy the wonderful illustrations of Pauline Kirk and other contributors which make this book a wonderful feast of poetry, prose and drawing: an ideal gift for Granma or Grampa. 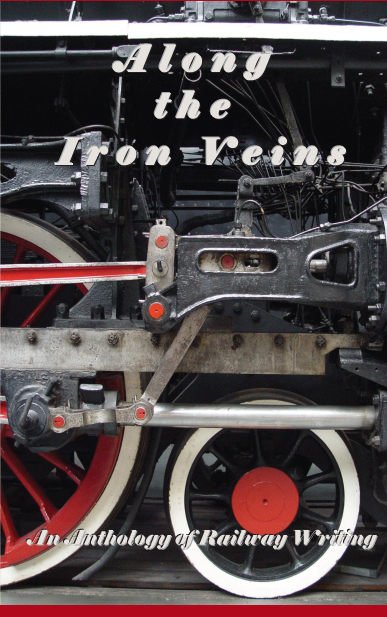 Along the Iron Veins was launched at the York Railway Institute’s A Passion for Trains event on Saturday 25th September.